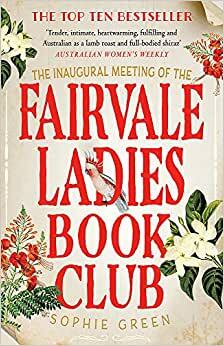 Start reading The Inaugural Meeting of the Fairvale Ladies Book Club on your Kindle in under a minute. 3.0 out of 5 starsFriendship and the Outback and books dont add up. The theme of women and their friendships and their interactions is one I am usually interested in and I looked forward to this book with its added attraction of books very much. However, the elements of this book did not gel for me. Towards the end, I wanted it to be finished. The author has created a range of interesting characters who have found strength, or have to find strength, in the course of the novel, and that is handled convincingly. The Northern Territory is an important backdrop but I never warmed to it. The historical background of the eighties is a period I remember well, but I found the timeline at the start of sections and the characters reference to these events stilted. A bit of light reading, but very enjoyable non the less. I was drawn to the time and setting, the late 1970s until 1981, which was when I first moved to Darwin. We travelled to Katherine and went 'bush' frequently so I found the subject relatable and very authentic. It is a story about five women and their lives. The book club is what draws them all together, although Sybil and Rita knew each other through their nursing days in Sydney. It covers a lot of topics, single motherhood, infertility, grief, inter racial relationships, family alienation and major trauma. Everyday things faced by everybody. Thoroughly enjoyed this book and getting to know the women and their lives in the Northern Territory of Australia. Great book, I really enjoyed reading it and love a good Aussie book. 5.0 out of 5 starsEducational engrossing . Educational engrossing.I enjoyed from the second chapter and could not put it down. Ijust wanted to know who would have the next experience or whose life we would get to know more about. 3.0 out of 5 starsI completed reading it as it was for my book club but I wouldn't recommend it. This was a really light-weight book - a bit Mills and Boonish. I completed reading it as it was for my book club but I wouldn't recommend it. Not deep at all, a soapie set in the outback. It may interest a grandma looking for a book to read on the plane. I didn't hate it, but its barely worth the two stars.